Lust Lust Lust is best heard loud loud loud. At a medium volume, it loses vitality. Any lower and it's a complete waste of time. Sune Rose Wagner and Sharin Foo's twisted update on early rock riffs and Jesus & Mary Chain distortion was built for intensity, and when cranked up to speaker-rattling levels, that agenda is clear. Granted, any album would gain new (and not necessarily pleasing) power at exaggerated volumes, but Lust Lust Lust sounds specifically engineered for eardrum-exploding impact. The few instruments-- guitar, drums, bass, guitar, synths, vocals, and guitar-- all bleed together into an aggressively trebly jangle, Wagner's riffs and waves of distortion washing over you like a bad trip. We speak to the NYC-based Danes about switching record labels, boycotting remakes of classic films, writing songs in bed, and their new album, Lust Lust Lust. 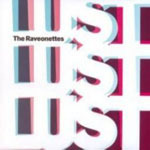 On their third LP, the Raveonettes work in various keys, pen longer tracks, and employ additional players and guests, including Ronnie Spector, Martin Rev, and Moe Tucker.